144 Marlborough is located on the south side of Marlborough, between Clarendon and Dartmouth, with 142 Marlborough to the east and 146 Marlborough to the west. 144 Marlborough was built in 1872-1873 by John Fisher Farrington, a carpenter and builder, for speculative sale, one of five contiguous houses (140-142-144-146-148 Marlborough). He had built three contiguous houses in 1871-1872 at 132-134-136 Marlborough. 138 Marlborough was a vacant lot until 1891. Click here for an index to the deeds for 144 Marlborough. On November 12, 1873, 144 Marlborough was purchased from John Farrington by Margaret G. (Homer) Lovejoy, the wife of Joseph Lovejoy, a carpetry dealer. They previously had lived at the Evans House hotel. Joseph Lovejoy died in October of 1874, and Margaret Lovejoy moved soon thereafter. On May 1, 1875, 144 Marlborough was purchased from Margaret Lovejoy by Alvin Adams, founder of the Adams Express Company. He and his wife, Anne Rebecca (Bridge) Adams, lived in Watertown. 144 Marlborough became the home of his son and daughter-in-law, Edward Livingston Adams and Emily (Macy) Adams. They previously had lived at 116 Marlborough. Edward Adams was affiliated with his father’s express firm and also was treasurer of the Little Rock and Fort Smith Rail Road. Alvin Adams died in September of 1877 and 144 Marlborough was inherited by his three children: Waldo Adams, Edward Adams, and Helen Frances (Adams) Dinsmore, the wife of William Brown Dinsmore, Jr. (her interest held in a trust for her benefit). On October 29, 1885, Edward Adams acquired Waldo Adams’s one-third interest, and on January 14, 1886, he acquired Helen Frances Dinsmore’s one-third interest. Edward and Emily Adams continued to live at 144 Marlborough during the 1886-1887 winter season, but moved thereafter to Newton. He continued to own 144 Marlborough and lease it to others. By the 1887-1888 winter season, 144 Marlborough was the home of Perkins Bass and his wife, Clara (Foster) Bass. They had lived at 166 Marlborough in 1885. They also maintained a home in Peterborough, New Hampshire. Perkins Bass had been an attorney in Chicago and served as US District Attorney for Northern Illinois during the Lincoln Administration. They continued to live at 144 Marlborough during the 1890-1891 season, but moved thereafter. 144 Marlborough was not listed in the 1892 Blue Book. By the 1892-1893 winter season, 144 Marlborough was the home of Mr. and Mrs. G. L. Clark. They continued to live there in 1894. It appears that Edward Adams — who continued to own 144 Marlborough — may have maintained a Boston residence there in addition to his home in Newton. He is listed at 144 Marlborough in the City Directories (but not the Blue Books) through 1894. 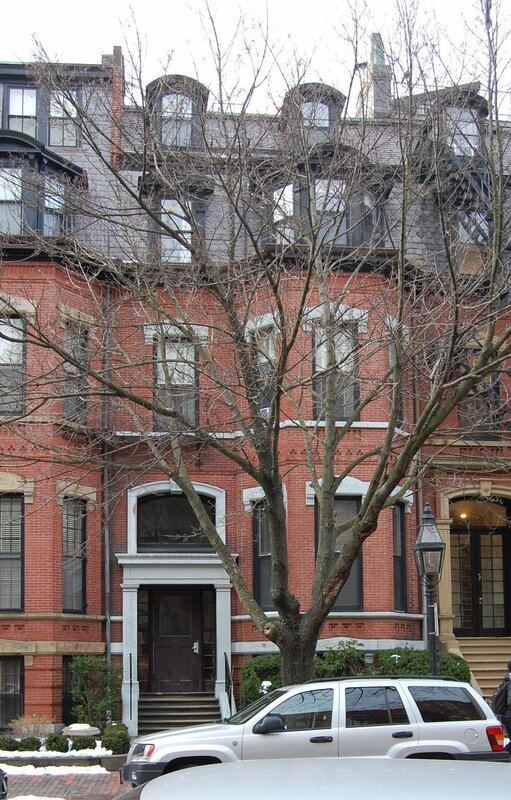 In about 1894, he and his wife moved from Newton back to Boston and were living at the Hotel Hamilton at 260 Clarendon by the 1894-1895 winter season. By the 1894-1895 winter season, 144 Marlborough was the home of retired wallpaper merchant Charles Henry Hayden. He was unmarried. He previously had lived at 299 Beacon. On June 30, 1896, Charles Hayden purchased 144 Marlborough from Edward Adams. He continued to live there until his death in August of 1901. The house was not listed in the 1902-1905 Blue Books. On December 3, 1904, 144 Marlborough was purchased from Charles Hayden’s estate by Laurence Minot, who made it his home. In January of 1905, Laurence Minot and Robert H. Gardiner, as trustees under the will of Laurence Minot’s brother, William Minot, purchased 142 Marlborough and it became the home of William Minot’s son-in-law and daughter, Henry Morse Channing and Katharine (Minot) Channing. They had married in November of 1904 and had lived at 3 Exeter during the 1904-1905 winter season. They also maintained a home in Sherborn. Laurence Minot had lived at 24 Marlborough until about 1901, when he moved to 409 Commonwealth to live with Katharine Minot following William Minot’s death in November of 1900. They had continued to live together at 409 Commonwealth until her marriage to Henry Channing. In mid-1908, Laurance Minot was joined at 144 Marlborough by his nephew (Katharine’s brother) and his wife, William Minot and Lucy (Woodworth) Minot. They had married in June of 1908, and 144 Marlborough probably was their first home together. He was an attorney and a stockbroker. They continued to live there until the 1911-1912 winter season, when they moved to 142 Marlborough (the Channings having moved to Sherborn). By the 1913-1914 winter season, Laurence Minot’s nephew, Sedgwick Minot, lived with him (he was the brother of Katharine (Minot) Channing and William Minot). He also maintained a home in New York City, where he was treasurer of the Courtessis Cigarette Company. He married in December of 1916 to Jane Adelaide Gould, after which they made New York City (and later Paris) their home. Laurence Minot continued to live at 144 Marlborough until his death in June of 1921. 144 Marlborough was inherited by his niece, Katharine Channing. On October 15, 1921, 144 Marlborough was purchased from Katharine Channing by Mary Gould (McMurtrie) Hopkins, the wife of architect James Cleveland Hopkins. They also maintained a home in Dover, Massachusetts. During the 1925-1926 winter season, the Hopkinses were living elsewhere and 144 Marlborough was the home of attorney Henry Eldridge Warner and his wife, Henrietta Edla (Slade) Warner. They also maintained a home in Lincoln, which had been their primary residence in 1925. By the 1926-1927 season, they had moved to 406 Beacon. During the 1926-1927 winter season, 144 Marlborough was the home of Charles Frothingham Leland and his wife, Margaret Waters (Carr) Leland. Charles Leland owned a farm in Southborough, which also was their second home. By the 1927-1928 winter season, the Lelands had moved to 7 Fairfield and James and Mary Hoplins were once again living at 144 Marlborough. They continued to live there during the 1932-1933 winter season, but spent the next season at the Hotel Lincolnshire, and thereafter they leased 144 Marlborough to others. During the 1934-1935 winter season, it was the home of Charlotte Howe (Johnson) Guild, the widow of Governor Curtis Guild, Jr. She previously had lived at 124 Marlborough. She moved to 190 Marlborough by the next season. In October of 1935, James and Mary Hopkins applied for (and subsequently received) permission to install fire escapes on the rear of the building, indicating that the use was to be a lodging house. No separate formal approval allowing that use appears in the Building Department’s files. By the 1935-1936 winter season, 144 Marlborough was the home of Maude Lillian (Dearborn) Guyette Bush, the widow of Frank Edward Guyette and of George N. Bush, and her unmarried children, Charles Nelson Bush and Olive Dearborn Bush. They previously had lived at 303 Berkeley. She operated 144 Marlborough as a lodging house She continued to live there in 1941, but had moved to 207 Bay State Road by 1942. On July 22, 1941, 144 Marlborough was purchased from Mary Hopkins (by then a widow living in Cambridge, James Hopkins having died in November of 1938), by Jacob Leroy Garber, a postal clerk and realtor, and his wife, Edith (Edythe) Ila (Chasens) Garber. They operated it as a lodging house. 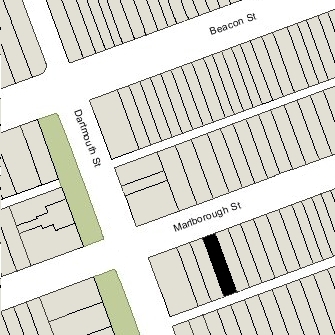 They lived at 350 Marlborough and also owned 195 Beacon, and operated both as lodging houses. On February 29, 1952, the Garbers transferred 144 Marlborough into his name as trustee of Byron Hall Trust. The property changed hands and on July 15, 1960, was acquired by John H. Ayvazian, Jr., Nubar J. Dinjian, George Najarian, and Thomas Moranian, as trustees of the Penwood Realty Trust. In August of 1960, the trust applied for (and subsequently received) permission to convert the property into seven apartments. The property changed hands. It remained an apartment house in 2016.